The number of Nudix hydrolase family members varies widely among different organisms. In order to understand the reasons for the particular spectrum possessed by a given organism, the substrate specificity and function of different family members must be established. The Y87G2A.14 Nudix hydrolase gene product of Caenorhabditis elegans has been expressed as a thioredoxin fusion protein in Escherichia coli and shown to be a CoA diphosphatase with catalytic activity towards CoA and its derivatives. The products of CoA hydrolysis were 3',5'-ADP and 4'-phosphopantetheine with Km and kcat values of 220 μM and 13.8 s-1 respectively. CoA esters yielded 3',5'-ADP and the corresponding acyl-phosphopantetheine. Activity was optimal at pH 9.5 with 5 mM Mg2+ and fluoride was inhibitory with a Ki of 3 μM. The Y87G2A.14 gene product has a potential C-terminal tripeptide PTS1 peroxisomal targeting signal – SKI. By fusing a Y87G2A.14 cDNA to the C-terminus of yeast-enhanced green fluorescent protein, the enzyme appeared to be targeted to peroxisomes by the SKI signal when transfected into yeast cells. Deletion of SKI abolished specific targeting. The presence of related sequences with potential PTS1 or PTS2 peroxisomal targeting signals in other organisms suggests a conserved peroxisomal function for the CoA diphosphatase members of this group of Nudix hydrolases. The Nudix hydrolase family comprises enzymes that hydrolyse predominantly the diphosphate (pyrophosphate) linkage in a variety of nucleoside triphosphates, dinucleoside polyphosphates, nucleotide sugars and nucleotide cofactors having the general structure of a nu cleoside di phosphate linked to another moiety, X [1, 2]. They are found in archaea, eubacteria, animal, plants, and fungi and all possess the Nudix box sequence signature motif Gx5Ex5 [UA]xREx2EExGU (where U is an aliphatic hydrophobic amino acid) [1, 3]. The proposed functions of this family are to eliminate potentially toxic nucleotide metabolites from the cell and to regulate the concentrations of nucleotide cofactors and signalling molecules for optimal cell growth and survival. The number of genes encoding Nudix hydrolases varies widely, from zero in Mycoplasma genitalium to 22 in Deinococcus radiodurans[5, 6]. This variation presumably reflects the growth or environmental adaptability, stress tolerance and metabolic capacity of the different organisms. The Nudix hydrolases thus offer an ideal system with which to study the evolution of a largely inessential protein family and its contribution to the individual biology of an organism. Understanding such variation requires a combination of detailed biochemical, genetic and cellular studies to reveal the individual functions of family members within the set in any given system. In the case of multicellular eukaryotes, the nematode Caenorhabditis elegans offers a genetically amenable model system with which to carry out such studies. There are 11 members of the Nudix hydrolase family in C. elegans. So far only two of these have been characterized – a diadenosine tetraphosphate pyrophosphohydrolase (the orthologue of human NUDT2)  and an NADH diphosphatase . Sequence comparisons would predict the existence of an ADP-sugar diphosphatase (NUDT5 orthologue) , an ADP-ribose diphosphatase (NUDT9 orthologue) , a diphosphoinositol polyphosphate pyrophosphohydrolase (NUDT3/4 orthologue) , two probable coenzyme A diphosphatases, one of which is highly similar to the mouse Nudt7 CoA diphosphatase , and 4 proteins of unknown function, including one with a strong similarity to the Saccharomyces cerevisiae PSU1/DCP2 protein [13, 14] and another similar to the developmentally-regulated mouse RP2 protein . Recent characterization of the S. cerevisiae NADH and CoA diphosphatases [16, 17] and the mouse Nudt7 CoA diphosphatase  has revealed that they are located in peroxisomes. The function of these peroxisomal enzymes may be to regulate the concentration of these essential nucleotide cofactors for peroxisomal metabolism or, by analogy with the E. coli MutT 8-oxo-dGTPase, to eliminate toxic modified cofactor metabolites from the highly oxidizing peroxisomal environment. In order to investigate these possibilities in the C. elegans model system, we have cloned and characterised the putative C. elegans Y87G2A.14 CoA diphosphatase and shown that it displays the expected enzymatic activities and that it appears to be targetted to peroxisomes by a C-terminal PTS1 targeting signal. The C. elegans Y87G2A.14 gene encodes a 234 amino acid protein with an expected molecular weight of 26,601 Da. It was amplified by PCR from a C. elegans cDNA library. The PCR fragment was inserted into the pET-32b(+) expression vector and the nucleotide sequence of the insert was determined to be exactly the same as that submitted to GenBank under accession no. CAB54476. The recombinant plasmid pETY87G2A.14 was then used to transform E. coli BL21 (DE3) cells to generate a His-tagged thioredoxin fusion protein with an expected molecular mass of 43,731 Da. When the Trx-Y87G2A.14 fusion protein was expressed at 37°C, it was confined to inclusion bodies, so the induction temperature was decreased to 25°C to enhance protein solubility. As the expression level was low at this temperature, the induction time was increased to 8 h. These conditions markedly increased the solubility of Trx-Y87G2A.14 which was then purified from the soluble fraction (Fig 1, lane 2) to apparent homogeneity on NiCAM™-HC resin (Fig 1, lane 3). To determine the molecular weight of the Y87G2A.14 protein itself, the Trx-Y87G2A.14 fusion was cleaved with thrombin, which generated Y87G2A.14 with an apparent molecular weight of 27 kDa (expected molecular weight, 29,807 Da) and thioredoxin (15 kDa, Fig 1, lane 4). Purification and cleavage of Trx-Y87G2A.14 fusion protein. Samples were analysed by SDS-PAGE (15% polyacrylamide) and stained with Coomassie Brilliant blue R 250. Lane 1, 2 μg protein standards: bovine serum albumin (66 kDa), ovalbumin (45 kDa), glyceraldehyde 3-phosphate dehydrogenase (36 kDa), carbonic anhydrase (29 kDa), trypsinogen (24 kDa), soybean trypsin inhibitor (20 kDa) and α-lactalbumin (14.2 kDa); lane 2, soluble cell extract of BL21 (DE3) cells transformed with recombinant plasmid pETY87G2A.14 and induced with 1 mM IPTG for 8 hours at 25°C before applying to a column of NiCAM™-HC resin ; lane 3, 3 μg purified Trx-Y87G2A.14 fusion protein; lane 4, 3 μg purified Trx-Y87G2A.14 fusion protein after cleavage with thrombin. Purified Trx-Y87G2A.14 was inactive towards the following nucleotides when assayed at a fixed concentration of 0.5 mM: NADH, NAD+, NDP-sugars, 5'-(d)NTPs, 5'-NDPs, 5'-NMPs and diadenosine polyphosphates. High activity was found with CoA and its derivatives. 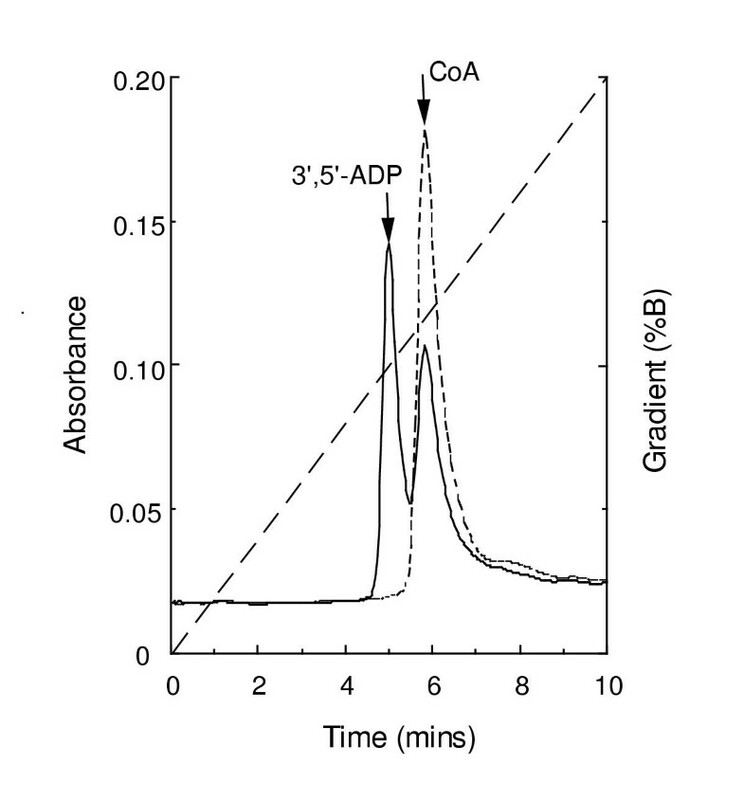 HPLC analysis of CoA hydrolysis by Trx-Y87G2A.14 showed that the enzyme was a CoA diphosphatase, cleaving the diphosphate linkage in CoA to yield adenosine 3',5'-bisphosphate (3',5'-ADP) and 4'-phosphopantetheine (Fig 2). Identification of reaction products of CoA hydrolysis. Reaction mixtures containing 0.5 mM CoA were incubated at 37°C for 20 min with or without 0.1 μg Trx-Y87G2A.14 fusion protein and the products separated by HPLC as described in Materials and methods. Without enzyme (------), with enzyme (______), gradient (— — — — —). Positions of authentic standards are indicated. Trx-Y87G2A.14 displayed optimal activity with 0.5 mM CoA as a substrate at pH 9.5. A divalent metal ion was absolutely required for activity, with optimal activity at 5 mM MgCl2. In common with all other Nudix hydrolases tested, fluoride was a strong inhibitor with a Ki value of approximately 3 μM (results not shown). Km, and kcat values for CoA, CoA esters and oxidized CoA were calculated by non-linear regression from data obtained by HPLC analysis (Table 1). A graphical example of the data for CoA in the form of a hyperbolic plot (Fig 3a) and double reciprocal plot (Fig 3b) show that the enzyme obeys simple Michaelis-Menten kinetics. The kcat / Km ratios show that the enzyme prefers reduced forms of CoA to oxidized CoA (Table 1) with CoA itself the best substrate of those tested. Lineweaver-Burk and Michaelis-Menten (inset) plots for the hydrolysis of CoA. Reaction mixtures containing various concentrations of CoA (0.05–0.7 mM) were incubated at 37°C for up to 20 min with 0.1 μg Trx-Y87G2A.14 fusion protein. Initial rates of hydrolysis were determined after separation of the products by HPLC as described in Materials and methods. Data were collected using the HPLC assay described in Materials and methods. Y87G2A.14 has the C-terminal tripeptide sequence SKI. This conforms to the pattern typical of PTS1 peroxisomal targeting signals found in many peroxisomal matrix proteins, suggesting that Y87G2A.14 may be targeted to these organelles [18, 19]. However, possession of a potential PTS1 sequence is not always sufficient on its own to result in peroxisomal targeting and other elements of the protein sequence may also be involved. Since targeting of animal peroxisomal proteins expressed in yeast has often been observed, yeast cells were transformed with expression plasmids encoding C-terminal or N-terminal fusions of Y87G2A.14 to yeast-enhanced green fluorescent protein (yEGFP) in order to determine the subcellular location of Y87G2A.14. The cells were then examined by confocal microscopy. Cells transformed with pY87G2A.14-yEGFP, in which the C-terminus of Y87G2A.14 is fused to the N-terminus of yEGFP, showed a diffuse, cytoplasmic fluorescence with no clear subcellular localization (Fig 4a). In contrast, cells transformed with pyEGFP-Y87G2A.14, in which the C-terminal tripeptide SKI is free to act as a targeting signal showed the clear punctate fluorescence that is indicative of yeast peroxisomes  (Fig 4b). The identity of SKI as the targeting signal was confirmed by transformation of cells with pyEGFP-Y87G2A.14Δ SKI, in which the C-terminal tripeptide was deleted during construction. This again showed a diffuse, cytoplasmic, fluorescence (Fig 4c). Together, these results strongly suggest that Y87G2A.14 is targeted to peroxisomes by its C-terminal tripeptide, SKI. On the basis of its sequence, the C. elegans Y87G2A.14 gene product was predicted to be a peroxisomal coenzyme A diphosphatase. In addition to the Nudix motif, Y87G2A.14 possesses the PROSITE UPF0035 motif (Fig 5), which we have previously suggested confers a specificity for coenzyme A and its derivatives , and a C-terminal tripeptide, SKI, that conforms to the pattern typical of PTS1 peroxisomal targeting signals. The experiments described here confirm these predictions. Fig 5 shows a multiple sequence alignment of the motif-containing region of Y87G2A.14 with related sequences from other organisms. Those marked with a tick have been experimentally shown to be coenzyme A diphosphatases [6, 12, 17]. In most cases, higher organisms possess two related sequences, e.g. mouse Nudt7 and Nudt8, one of which encodes a peroxisomal enzyme (e.g. Nudt7). However, S. cerevisiae has only one sequence containing the UPF0035 motif while Arabidopsis thaliana has three, and the second of the two Drosophila melanogaster sequences, RH61317, is currently only represented in GenBank by a single expressed sequence tag, so its status is still questionable. For the peroxisomal enzymes, either a putative C-terminal PTS1 or an N-terminal PTS2 targeting signal is present. Interestingly, in each case, the putative PTS2 signal is contained within or near a predicted mitochondrial targeting or chloroplast transit peptide sequence [20–22], suggesting a possible dual location for these proteins. Such a possibility has not yet been experimentally observed; however, mutation of a glutamate five residues to the C-terminal side of the PTS2 of rat peroxisomal 3-ketoacyl-CoA thiolase to a neutral or basic amino acid has been shown to result in partial mitochondrial targeting, suggesting that the negative charge on glutamate may normally block translocation to the mitochondria . Whether or not a system exists in vivo to regulate dual targeting is clearly a topic requiring further investigation. The non-peroxisomal sequences provide no clear indication of possible subcellular location, hence they are likely to be cytoplasmic. Given the existence of mitochondrial, peroxisomal and cytoplasmic pools of CoA and CoA esters , it would not be surprising to find CoA diphosphatase activity in all these locations. However, the precise substrate specificities of the "cytoplasmic" activities remain to be determined. Partial sequence alignment of Y87G2A.14 and related sequences. 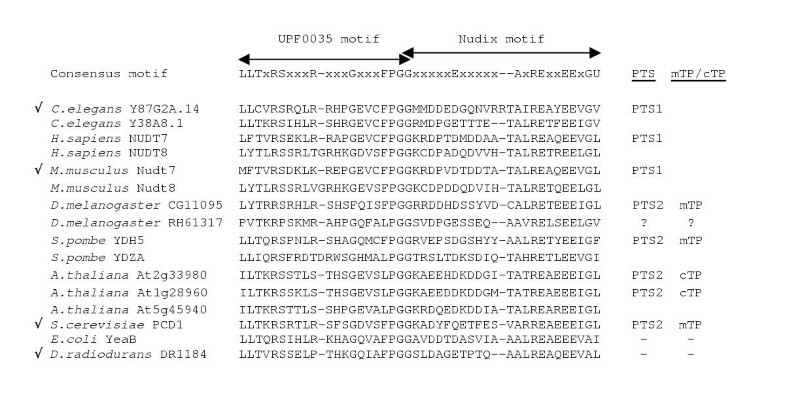 The partial sequence of Y87G2A.14 containing the UPF0035 and Nudix motifs (arrowed) was aligned using the Clustal W program with related sequences from other organisms retrieved from a BLAST search. Organisms and database accession numbers are: Caenorhabditis elegans Y38A8.1, Q23236; Homo sapiens NUDT7, XP_058753; H. sapiens NUDT8, AI743601; Mus musculus Nudt7, Q99P30; M. musculus Nudt8, AK009700; Drosophila melanogaster CG11095, Q9VY79; D. melanogaster RH61317, BI631687; Schizosaccharomyces pombe YDH5, Q92350; S. pombe YDZA, 013717; Ambidopsis thaliana At2g33980, 022951; A. thaliana At1g28960, Q9SHQ7; A. thaliana At5g45940, BAB09322; Saccharomyces cerevisiae PCD1, Q 12524; Escherichia coli YeaB, P43337; Deinococcus radiodurans DR1184, Q9RV46. Sequences encoding experimentally confirmed CoA diphosphatases are marked with a tick. Columns on the right indicate whether the full sequence contains a putative peroxisomal targeting signal (PTS1 or PTS2) and/or a putative mitochondrial targeting peptide (mTP) or chloroplast transit peptide (cTP). Regarding the possible function of these enzymes in general, and the C. elegans peroxisomal enzyme in particular, a recent functional genomic analysis by RNA-mediated interference of C. elegans chromosome I, on which the Y87G2A.14 gene is located, revealed no phenotype in relation to growth, survival, fecundity or morphology when the expression of Y87G2A.14 was ablated . This would indicate that, within the limitations of RNAi, the CoA diphosphatase activity of Y87G2A.14 is not essential. However, now that the biochemical properties of this protein have been established, a more detailed and targeted biochemical analysis can be undertaken that should reveal its cellular function and benefit to the organism. Nudix hydrolases are believed to regulate the concentrations of nucleotides for optimal cell performance and also to eliminate potentially toxic nucleotide metabolites from the cell. With regard to regulation, CoA diphosphatase activity is associated with the 400 kDa CoA synthesizing protein complex from S. cerevisiae, in which it forms part of an alternative pathway for CoA biosynthesis that differs from the principal route of 3'-dephospho-CoA and CoA synthesis by this complex . This CoA/4'-phosphopantetheine cycle involves hydrolysis of CoA to 3',5'-ADP and 4'-phosphopantetheine, which then reacts with ATP to give 3'-dephospho-CoA then CoA. Whether such a pathway operates in peroxisomes and whether the C. elegans Y87G2A.14 protein is involved remain to be established. With regard to the elimination of toxic nucleotide metabolites, the 13-fold higher kcat / Km ratio for oxidized CoA (CoASSCoA) compared to CoA for the S. cerevisiae PCD1 CoA diphosphatase previously suggested to us that this enzyme might preferentially remove non-functional and potentially toxic oxidized CoA and CoA esters from within the oxidizing environment of the peroxisomes . However, neither the mouse Nudt7  nor the C. elegans Y87G2A.14 proteins show this preference. Nevertheless, the potential production of adenine ring-oxidized derivatives of CoA by reactive oxygen species generated in the peroxisomes analogous to the 2-oxo-dATP and 8-oxo-dATP substrates of the mammalian MTH1 Nudix hydrolase  suggests that such species could be more relevant substrates for peroxisomal CoA diphosphatases in vivo. The amenability of C. elegans to studies of cellular and molecular stress will allow the question of the biological function of these enzymes to be addressed. S. cerevisiae strain BY4741 (MAT a; his3D1; leu2D0; met15D0; ura3D0) was from Research Genetics. Calf intestinal alkaline phosphatase, yeast inorganic pyrophosphatase, Eco R1 and Bam H1 were from Roche while Bsp H1 (Pag1) was from Helena Biosciences. Pfu DNA polymerase was from Stratagene. All other chemicals and nucleotides were from BDH or Sigma. The E. coli expression vector pET-32b(+) was from Novagen and the yeast-enhanced green fluorescent protein (yEGFP) fusion vectors pUG35 and pUG36 were a gift from J.H. Hegemann, Institute of Microbiology, University of Düsseldorf, Germany. The C. elegans cDNA library was prepared from adult nematodes by H. M. Abdelghany, School of Biological Sciences, University of Liverpool, U.K.
A cDNA corresponding to the C. elegans Y87G2A.14 gene on chromosome 1 (GenBank accession no. CAB54476) was amplified from a cDNA library by PCR using as forward and reverse primers 5' GCAAATCATGAAGTGTGTGGTTAGCCGAGCTG 3' and 5' TAAATGAATTCACTAAATTTTGGATTTCGGTTC 3' respectively. These primers provided a Bsp H1 restriction site at the start of the amplified gene and an Eco R1 site at the end. After amplification with Pfu DNA polymerase, the DNA was recovered by phenol/chloroform extraction and digested with Bsp H1 and Eco R1. The digest was gel-purified and the restriction fragment ligated into the Nco1 and Eco R1 restriction sites of pET-32b(+) as both Bsp H1 and Nco1 form compatible ends with each other. The resulting construct, pETY87G2A.14, yielded Y87G2A.14 downstream of the 109-amino acid thioredoxin (Trx) fusion and His-tag and S-tag sequences under the control of an IPTG-inducible promoter. The structure of the insert was confirmed by sequencing. The construct was propagated by transformation of E. coli XL1-Blue cells. E. coli strain BL21(DE3) was transformed with pETY87G2A.14. A single colony was picked from an LB agar plate containing 50 μg/ml ampicillin and inoculated into 10 ml LB medium containing 50 μg/ml ampicillin and incubated at 37°C. When the cells reached an A600 of 0.5, they were transferred to 1 litre of fresh LB medium containing 50 μg/ml ampicillin and grown to an A600 of 0.3 at 37°C, then transferred to an incubator at 25°C. Isopropyl-1-thio-β-D-galactopyranoside (IPTG) was added to 1 mM at an A600 of 0.8, and the cells induced for 8 h. The induced cells (4 g) were harvested, washed and resuspended in 20 ml breakage buffer (50 mM Tris-HCl, pH 8.0, 50 mM NaCl, 1 mM DTT). The cell suspension was sonicated and the cell lysate was then cleared by centrifugation at 10,000 × g at 4°C for 15 min. The supernatant was applied to a 15 × 50 mm column of NiCAM™-HC resin (Sigma) equilibrated with 50 mM Tris-HCl, pH 8.0, 0.5 M NaCl, 1 mM 2-mercaptoethanol at a flow rate of 0.5 ml/min. 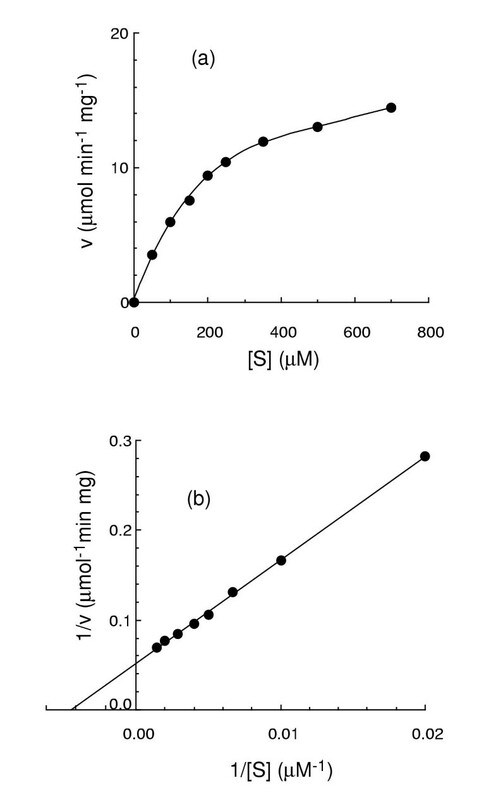 After eluting the unbound proteins, a linear gradient of 0–40 mM histidine in the same equilibration buffer was applied at flow rate of 1 ml/min and 1 ml fractions collected and analysed by SDS-PAGE. Those containing pure Trx-Y87G2A.14 fusion protein were collected, dialysed overnight at 4°C against 1 litre of 20 mM Tris-HCl, pH 8.0, 50 mM NaCl, ImM DTT and then concentrated by ultraflltration (Amicon) and stored at -20°C in 50% glycerol. Potential substrates were screened by measuring the Pi released after nucleotide hydrolysis in presence of inorganic pyrophosphatase or alkaline phosphatase . The standard assay (200 μl) for phosphodiester substrates was incubated at 37°C for 30 min and contained 50 mM l,3-bis [tris(hydroxymethyl)-methylamino]propane-HCl (BisTrisPropane-HCl), pH 8.0, 5 mM MgCl2, 1 mM DTT, 0.5 mM substrate, 0.1 μg of Trx-Y87G2A.14 fusion protein and 0.5 μg (1 unit) alkaline phosphatase. Assays with phosphomonoester substrates were as above, except 0.5 μg (100 mU) inorganic pyrophosphatase was used instead of alkaline phosphatase. The Pi released in each case was measured colorimetrically. Kinetic parameters and reaction products generated from hydrolysis of CoA and its derivatives were measured by high performance anion-exchange chromatography. The reaction mixtures (100 μl) contained 50 mM BisTrisPropane-HCl, pH 9.5, 5 mM MgCl2, 1 mM DTT (in cases of substrates requiring reducing conditions), substrate in the range of 0.05–0.7 mM, (0.1–1 mM in the case of oxidized CoA) and were incubated at 37°C for up to 20 min (during which time the reaction rates remained linear) with 0.1 μg Trx-Y87G2A.14 fusion protein. A 90 μl sample of each reaction mixture was applied to a 1 ml Resource-Q column (Amersham Pharmacia Biotech) equilibrated with 0.045 M CH3COONH4 (pH 4.6, adjusted with H3PO4), and eluted with a linear gradient from 0 to 0.45 M NaH2PO4 (pH 2.7 adjusted with CH3COOH) for 10 min at a flow rate of 2 ml/min . Elution was monitored at 259 nm and peaks identified with the aid of standards and quantified by area integration. Expression plasmids encoding C-terminal and N-terminal fusions of Y87G2A.14 to yeast-enhanced green fluorescent protein (yEGFP)  were constructed by amplification of the coding region of Y87G2A.14 from C. elegans cDNA by PCR using the same forward primer 5' CGACGGATCCATGAAGTGTGT 3' and one of the reverse primers 5' TAAATGAATTCACTAAATTTTGGATTTCGGTTC 3', 5' CACTAAGAATTCTATTTCGGTTCAAATTTCCTACTTGC 3', or 5' GCTCGAATGAATTCAATTTTGGATTTCGGTTC 3' to give PCR products "C", "CΔSKI" or "N" respectively. These primers provided a Bam H1 restriction site at the start of the amplified gene and Eco R1 sites at the end. PCR products "C" and "CΔSKI" were cloned as C-terminal fusion proteins to yEGFP, while PCR product "N" with a deletion of the Y87G2A.14 termination codon was cloned as an N-terminal fusion to yEGFP. After amplification with Pfu DNA polymerase, the DNA products were recovered by phenol/chloroform extraction and digested with Bam H1 and Eco R1. The digested PCR products "C", and "CΔSKI" were gel purified and the restriction fragments ligated between the Bam H1 and Eco R1 restriction sites of pUG36 (yEGFP-C-fusion) to give pyEGFP-Y87G2A.14 and pyEGFP-Y87G2A.14ΔSKI respectively. 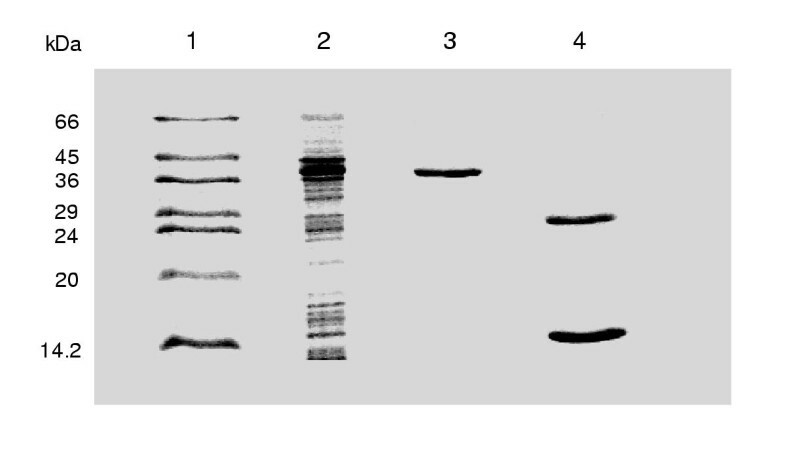 The digested PCR product "N" was gel purified and the restriction fragment ligated between the Bam H1 and Eco R1 restriction sites of pUG35 (yEGFP-N-fusion) to give pY87G2A.14-yEGFP. The structures of the inserts were confirmed by sequencing. The plasmids were propagated by transformation of E. coli XL 1-Blue cells. For microscopy, S. cerevisiae strain BY4741 was transformed with pyEGFP-Y87G2A.14, pyEGFP-Y87G2A.14ΔSKI or pY87G2A.14-yEGFP and grown on solid SC-Ura medium containing 2% glucose. Cells were viewed by conventional and confocal fluorescent microscopy on a Zeiss LSM510 confocal microscope with a 100 × 1.4 NA objective. Protein concentrations were estimated by the Coomassie blue binding dye-based colorimetric method using equal weights of bovine serum albumin, conalbumin, cytochrome c and myoglobin as standards . S.R. AbdelRaheim is the recipient of a postgraduate scholarship from the Egyptian government. The authors are grateful to D.G. Spiller for assistance with the confocal microscopy. The authors thank J.H. Hegemann and H.M. Abdelghany for their kind gift of materials.